Ground level spacious luxury 3 bedroom unit. 5 TV's, views and privacy. Ski Magazine rates Smuggler's notch the #1 Family Ski resort in America every year! My family can attest, this is true. Kids will learn to ski before your eyes, GUARANTEED! even as young as age 2! 3 year olds can enter camp and your teens will not be bored here. So much to do. We have used this unit for over fifteen years and have had the times of our lives. If you are a beginner or looking for advanced terrain, Smuggs is the only mountain that can offer both extremes. Snow boards welcome, night tubing, fireworks, ice skating, live shows, dog sledding, you name it, winter bliss! We are a family of avid skiiers. Have enjoyed Smuggs for both the amazing family atmosphere and some of the most challenging terrain in the east. It's the best most private most convenient three bedroom home on the mountain No argument. Did I mention we have a private outdoor heated pool? There simply is no more convenient way to go on a ski vacation. We have skied mountains all over the country and we find ourselves constantly comparing every one of them to our home in Smuggs. Wake up, roll out of bed, stroll down the hall to your locker, click in and ski. Come home for lunch or stay out on the slopes. Kids jump in the outdoor pool after a long day on the slopes and grab an apres skis brew on the porch. Epic. Located on the Smugglers Notch resort. Walk to village of Smugglers Not h resort or take free shuttle. Ski right to your front door, convenient lockers just inside the door. No lines, no parking! Pick up your skis and head right out to the slopes. First run guaranteed before lifts open! Right outside the door. Same level. Absolutely a ski lovers dream, ski right to your door and right out in the AM. Break for lunch in your own kitchen and get back to the skiing. In Main Village several other pools and spas. Our family had a wonder family ski vacation at Smugglers Notch. We did stay in the best ski in/out condo! The condo was bright and clean with plenty of space for 8 adults and an infant. We enjoyed the heated pool after a beautiful day on the slopes. I will come again next year. Our spring skiing trip was better than we thought possible. First time to Smuggs and we were impressed by the range of easy to difficult trails, great snow conditions and the excellent ski school. Our 4 year old had a blast in the full day camps. Loved the magic show. Great view onto the slopes from the condo and plenty of living room space made it easy to take a long lunch or call it an early day and stay in to play with the kids. Only downside of all condos at Smuggs is that it is a hike to get to Madonna and Sterling peaks, but you can take the shuttle if the green traverse trail is too tiring. We'd surely come back. We are a family of 5 with an extended family of 4 (2 adults and 2 teens). When we arrived at the base resort, we were amazed at the greeting we recieved from the Smuggs Staff. We were immediately checked in and started the trek up the access road. Our excitement kept growing as we drove past many units along the way. When we finally reached the pinacle, we pulled up right in front of our door at the very top and the condo is right on the main slope and had a beautiful heated outdoor pool right there! We wanted to get right out to the slopes! We rolled our gear right in to the lockers and walked right in to the condo. WHAT A VIEW! I get chills just thinking about going back again. The unit is meticulously maintainend, has an open plan living space for everyone to hang out in and everything you need for the perfect ski get-a-way. We parked our car and left it the entire stay as there is a free shuttle that takes you anywhere you need to go on the mountain. Our kids learned to ski and had a blast, my nephews and I were amazed at the terrain on Madonna Mountain! There are more gladed trails than anywhere I have ever skiied. Quality restaraunts, great accomodations, terrific mountain, no lines! Can't wait to go back. I only hope we can get this condo again. Probably the best location on the mountain! This is an excellent VRBO. We were a group of three families, with 5 kids. We had plenty of space and loved the heated outdoor pool. It was wonderful to come in from the slopes and have us all hang out in the pool under the bright moon and stars. The convenience of the slopeside location was wonderful. It was very clean. We had a fabulous time cross country skiing too. We could get on the trail system right from the condo. No dogs allowed - but we boarded our husky in Morrisville 22 miles away and were able to pick her up for a day so we could skijor with her at Smuggs. The nordic trails were in great shape and there were a lot of them. Bill, the condo owner is great to work with. 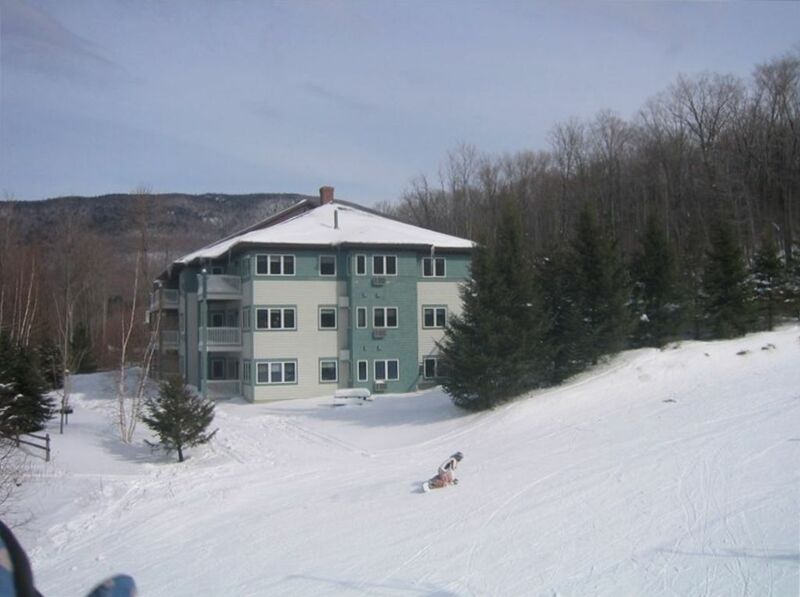 This condo is one the best slopeside deals for a three night weekend in Vermont! Thanks Bill!! We stayed here over the long holiday weekend and everything about the place was perfect. It came fully stocked with enough cutlery and plates for a large group. We were two couples with one child and the place was bigger than we could have asked for. There was a master bedroom with a full bath, jacuzzi tub and a king sized bed. The second bedroom had a double bed and the third bedroom had four single beds. There was a full second bathroom with a washer and dryer. The lift line was feet from the front door and you could ski down to the village. The views from the living room and bedrooms are beautiful and we can't wait to go back. This is a great mountain for every level.